We are visiting the landing beaches and battlefields of the D-Day landings on June 6, 1944. We started in Sainte-Mère-Église, having flown to Brussels and rented a car. Now we are visiting some more sites in the area around Sainte-Mère-Église. 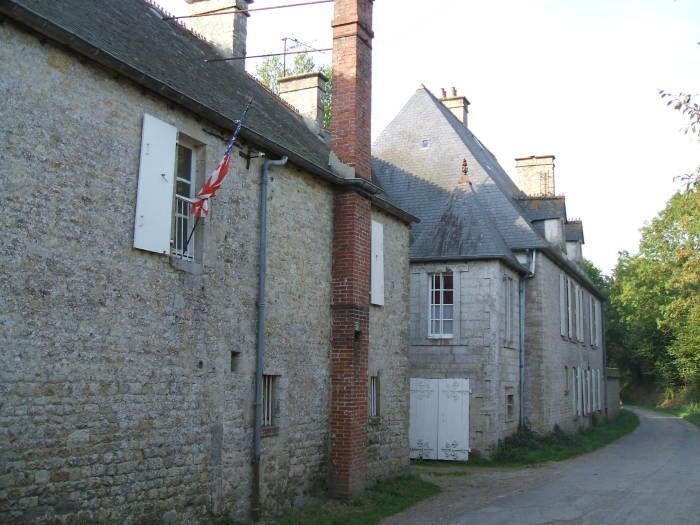 Brécourt Manor was the site of a significant battle described in Stephen Ambrose's book Band of Brothers and it was very dramatically depicted in the television miniseries. The manor is one kilometer north of Sainte-Marie-du-Mont and a half-kilometer west of the intersection of D 913 (Sonnier Road) and D 14 (Collins Road). Confusingly, D 14 becomes D 115 east of the D 913 intersection, so the number of Collins Road depends on the direction from which you are approaching. The manor is on a small side road, which might be the D 329. The nice thing about the 1:25,000 map #1311E is that you can tell that the lane intersects the D 14 road 500 meters to the north-west of that D 14 / D 913 intersection. See the map. The light blue lines are a 1000 meter grid. Without GPS you can still navigate easily if you pay attention to signs and estimate distances. 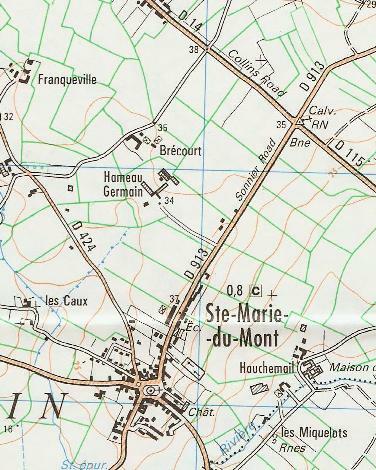 IGN 1:25,000 map showing the location of Brécourt Manor, north of Ste-Marie-du-Mont. Brécourt Manor is at UTM 30U 06287 54722 if you do have GPS. The D 329 is pretty much a single-lane road. There is room for cars to pass, but they have to be careful and one may need to pull to the side. 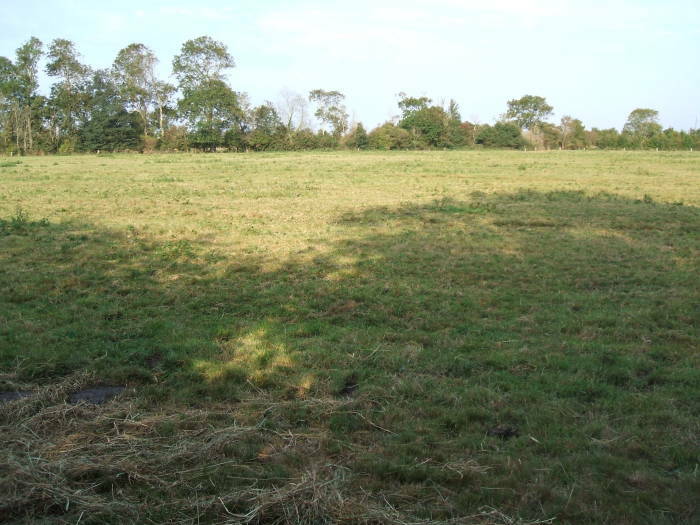 The field where the battle occurred is the one directly north of the manor house, shown as a solid black "C" shape on the map above. Notice that the IGN maps show walls and prominent fences as green lines. The field is open to the lane from the house north-east to the dot in the lane marking 35 meter elevation. From there it's a irregular and roughly trapezoidal shape extending to the north. 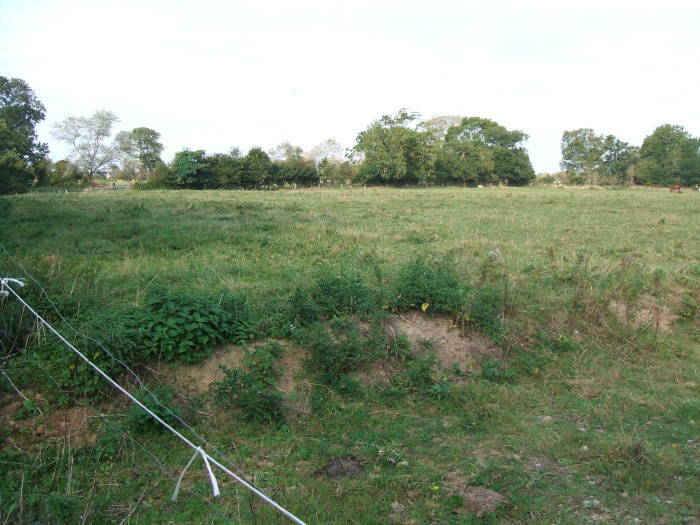 The straight fenceline along the field's east side and the irregular fenceline across along its west side were the locations of several German gun sites, as described below. The hedgerows in this part of Normandy really are earth berms about head-high, reinforced with roots, with brush and trees growing out of their tops. Along small lanes like the one running past Brécourt Manor, you're driving between two high walls of earth and vegetation. The trees come together overhead in places, turning the road into a tunnel through the vegetation. Ahead you see a large country house and farm buildings sitting right on the road. There's an American flag flying! This is Brécourt Manor. Brécourt Manor, flying an American flag. 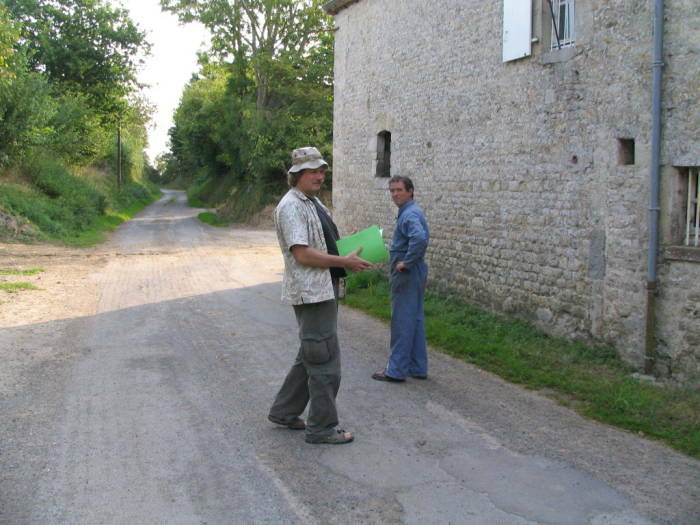 Verifying our navigation at Brécourt Manor, and hoping I'm not asked about American potato-renaming nonsense. The road widens quite a bit here, as it's almost the barn yard for the manor or at least where they have to get their tractors and other equipment out of the barns and into the fields across the lane. The picture shows how the narrow lane is lined by hedgerows forming head-high earth banks on either side, with vegetation arching up and over the lane. We pulled the van off the narrow road and got out to explore. The man who works the farm happened to come out, and we could verify that we were in the right place. We had a whole folder of photocopied maps, printouts from atlantikwall.org.uk and atlantikwall.co.uk, and other notes. Yes, this was the place. I was very glad he didn't ask about the anti-France hysteria raging in the U.S. at the time. Xenophobes had decreed that it was somehow patriotic to refuse to call French fries by their common name and insisted on calling them "freedom fries" instead. I wouldn't have had a good explanation, standing there in France under the U.S. flag he flew every day to honor the U.S. troops. 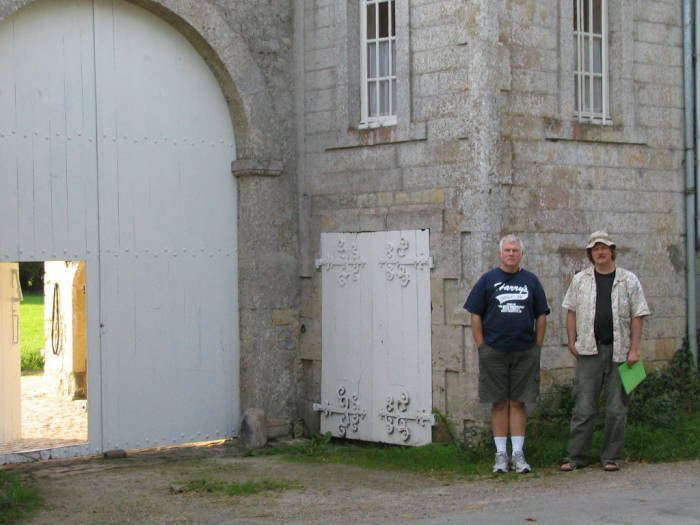 Jeff and Bob at the Brécourt Manor barnyard gate. 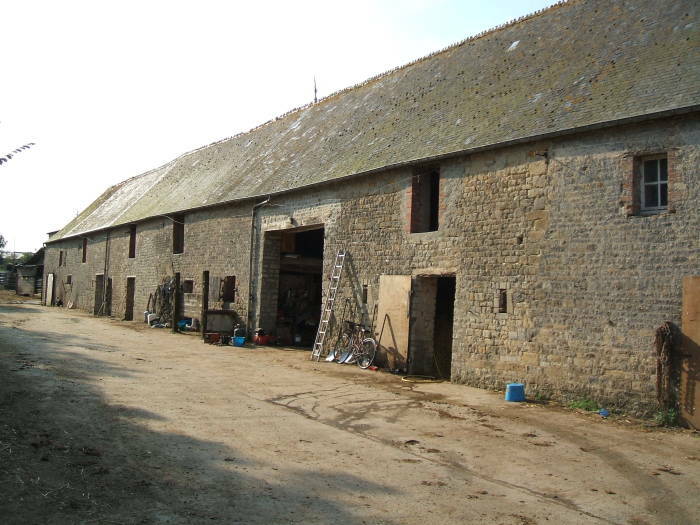 The large barn at Brécourt Manor. The source of the famous Normandy cheese and butter. If you're wondering, French cows say meuh. Les vaches en France disent «meuh». 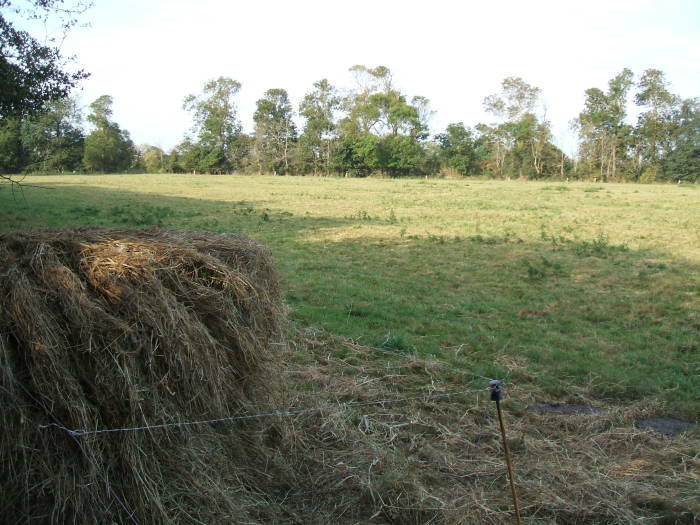 The fields where the battle occurred are now pasture, and I believe they were at the time. Normandy has been a major producer of dairy products for a long time, and they had a lot of dairy cows in some of the fields. Approaching the battlefield at Brécourt Manor from the direction of Utah Beach, climbing up the hedgerow and looking out between the trees. Visible across this pasture is the eastern treeline with the four 105 mm guns that needed to be silenced. 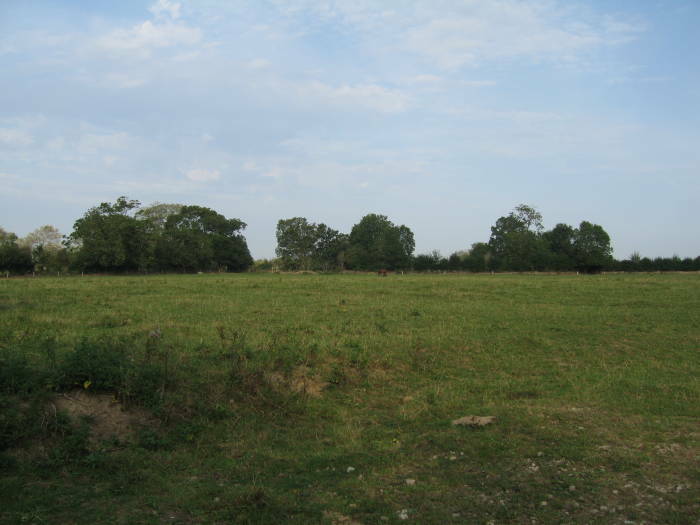 That same eastern treeline as seen from its opposite side, from within the pasture directly across the lane from Brécourt Manor. The 105 mm guns were in this treeline, firing away from this viewpoint toward the troops approaching from Utah Beach, about 5 kilometers away toward the clear horizon visible at right. There were four 105 mm guns in open emplacements along the north-south tree line and fence row along the east side of this field. There were three machine gun posts in the tree line and fence row along the west side. All of these were connected by slit trenches. Lightly armed airborne infantry had to take these well defended guns to allow the larger infantry force to advance across the fields from the landing sites on Utah Beach. 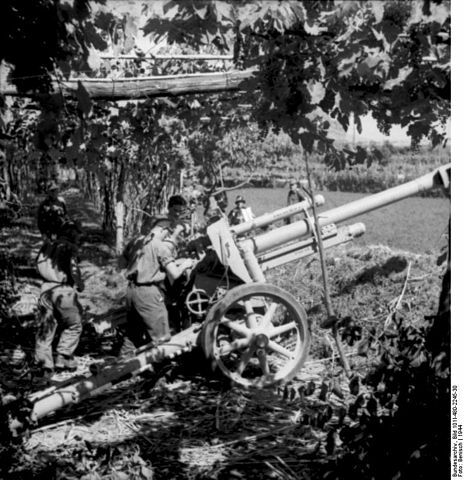 German government picture of a 105 mm gun firing from a concealed position. Presumably the 105 mm guns were one of these variants of the leFH or leichte FeldHaubitze (light field howitzer) series: 105 mm leFH 18, the 105 mm leFH 18M, and the 105 mm leFH 18/40. The initial design had a range of about 10.7 kilometers. The addition and modification of a muzzle brake and the recoil system led to an increase in maximum effective range from 10,675 to 12,325 meters. They had heavy, simple breech mechanisms and hydro-pneumatic recoil systems. They had wheeled carriages and were towed into place. The 105 mm guns at Brécourt Manor would have been in positions similar to that seen in the above Wikipedia image of a German government picture — at least partially concealed by foliage, and with cover provided by soil. Behind the thick Norman hedgerows, they would have had very effective cover. 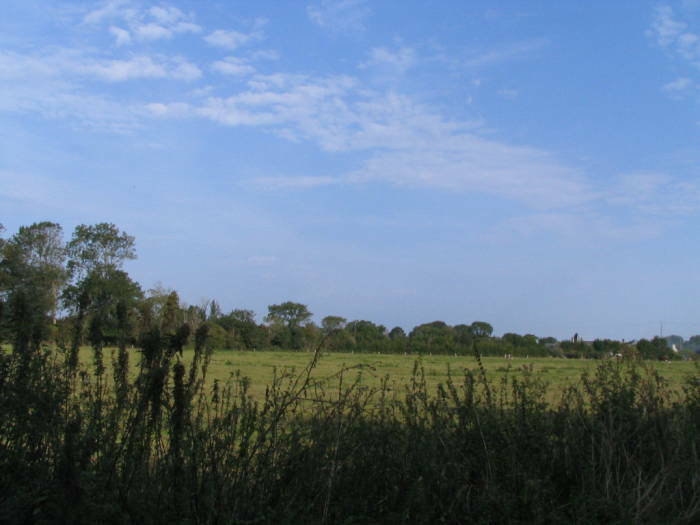 The hedgerows were thick, tall, and reinforced with centuries of root growth. The Allied lack of preparation for dealing with the hedgerows is one of the remaining mysteries of Operation Overlord. Field expedient methods were developed and deployed in the field, with steel "teeth" fastened to the fronts of tanks. The pre-invasion photoreconnaissance should have indicated their height by the shadows cast, and the French Resistance must have mentioned them. However, they were far greater hindrance than expected. 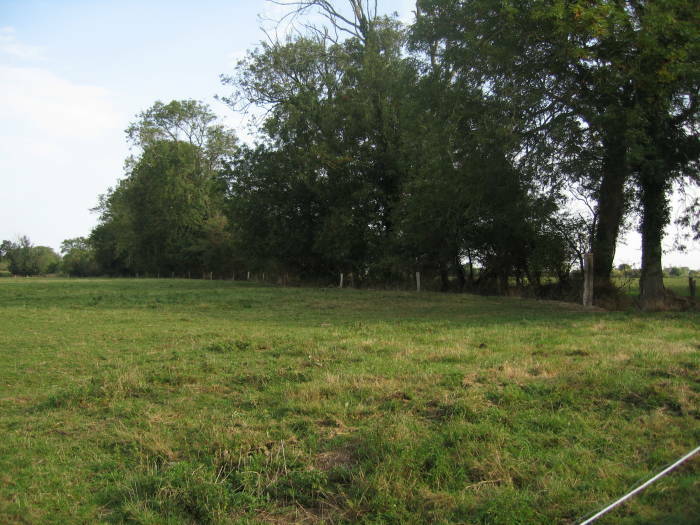 Looking north across the battlefield from the gate into the pasture directly across from Brécourt Manor. The 105 mm guns were to the right, the machine gun posts to the left. The far end of the western tree line toward the northernmost machine gun post. The center of the western tree line toward the middle machine gun post. Watch out for that electric fence! The south end of the western tree line and the southernmost machine gun post. 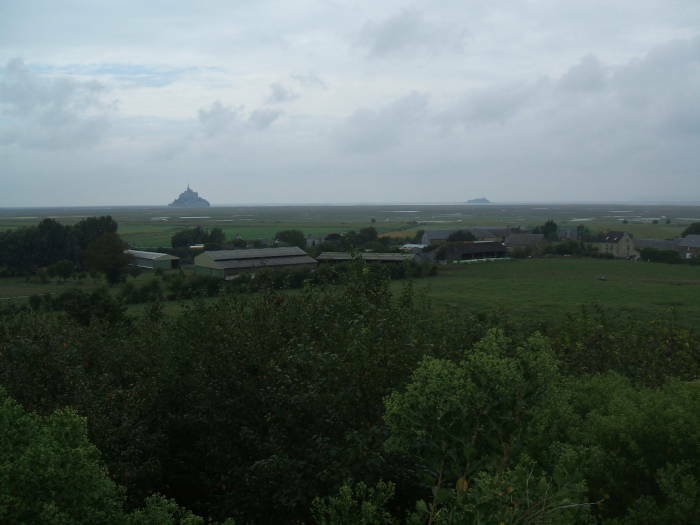 One day we drove west across the Cotentin Peninsula to its west shore, down that to Ponterson, and then to Mont Saint-Michel. It's a fortified old city on a rocky outcropping about a kilometer off the main coast line, joined by a narrow causeway. 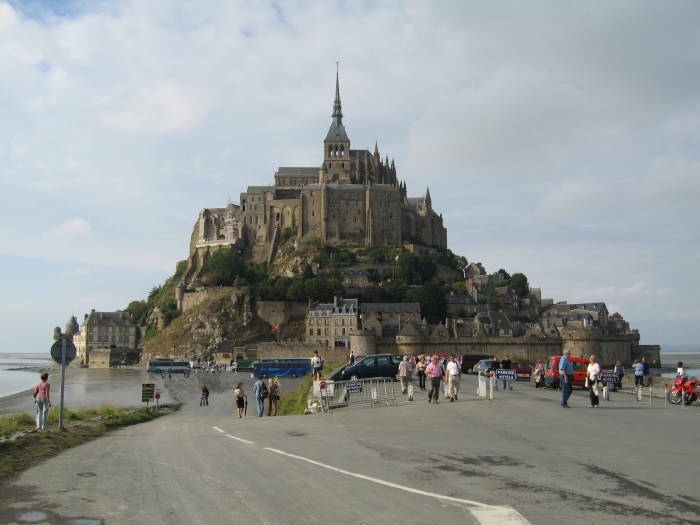 I have much more about visiting Mont Saint-Michel on another page. Mont St-Michel is visible on the horizon. The Gothic abbey spire and the fortified town. This was a stronghold back in the 5th and 6th centuries, when this part of Brittany was known by its Roman name of Armorica. The Romano-Breton people, Celtic people living in western Britain and Armorica, had a fortified settlement here until it was sacked by the Franks. A monastery was established in the 8th century. Ducal patronage after the Norman invasion of Britain in 1066 supported the abbey's construction. It was converted to a prison during the madness of the French Revolution, and it operated as such until 1863. The tides along the coast of Normandy and Brittany are high, and they are especially high here. The water level varies about 14 meters between high and low tides on this section of the coast, and when you combine that with a very gently sloping sea bed you get a waterline that varies widely and rapidly. As Victor Hugo famously said, "à la vitesse d'un cheval au galop" or "as swiftly as a galloping horse". Mont-St-Michel is famous for its dramatic tides here at the far eastern edge of Brittany, but the tides at the landing beaches in Normandy are about as high. 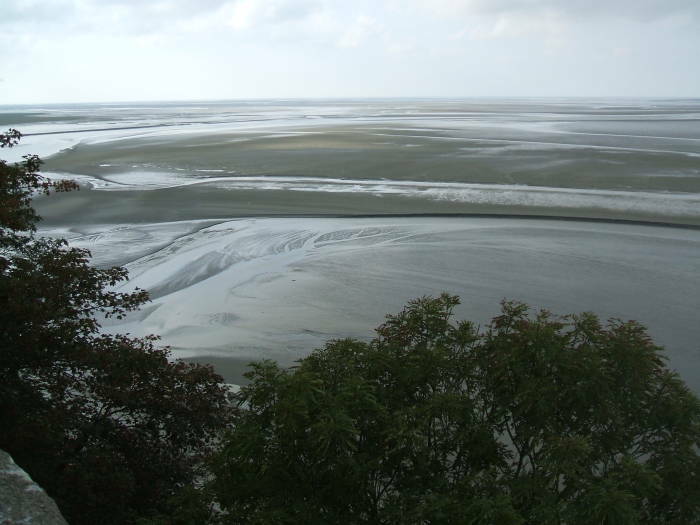 Looking out over the broad mud flats near low tide. We went to Sainte-Marie-du-Mont, where a relatively large church with a dramatic tower is in the town square. 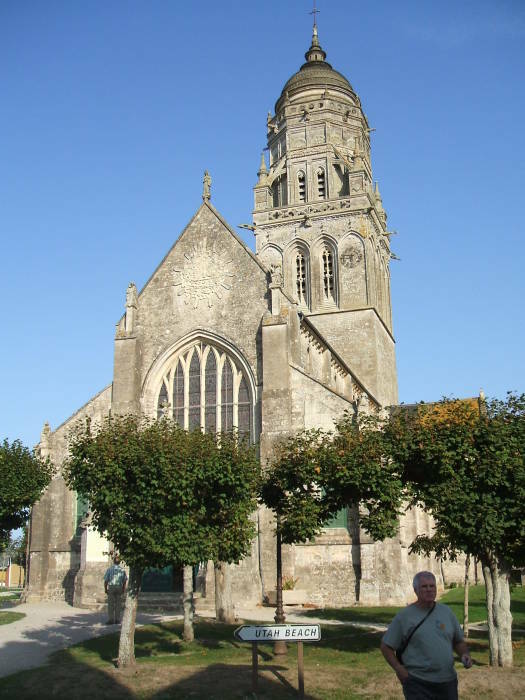 Many of the churches in Normandy feature in the history of D-Day. Their towers were useful landmarks. And, in many cases either the tower was used as a commanding firing position by snipers, or else the church served as a sanctuary for the wounded. In the case of Sainte-Marie-du-Mont, there was an engagement on D-Day between the U.S. 101st Airborne Division and the German Wehrmacht. Do you see the gravel footpaths leading right up to the church door? If the navigator is a bit vague on directions and says "Straight ahead" to mean "The square is ahead, go around the church so as to go around the square and continue straight ahead through town", the driver may end up driving right up to the door on the foot paths. At least the footpaths were wide enough to let us turn onto another footpath and reach the parking area to the side of the church. The church at Sainte-Marie-du-Mont. Jeff has swept away our tire tracks after Bob casually directed him to drive right up onto the gravel foot paths. 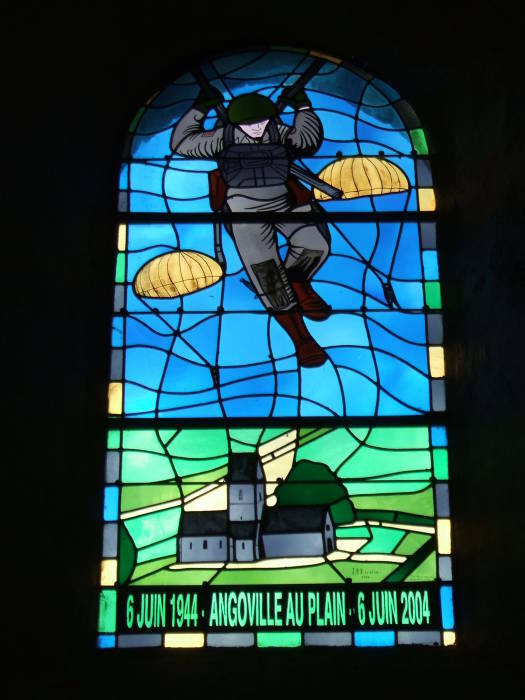 Stained glass window at Angoville au Plain commemorating D-Day. Sainte-Marie-du-Mont is a larger village today, but Angoville au Plain is still pretty much just the old church and a few houses. It's on the D 913 E extension off the D 913, which runs from Sainte-Marie-du-Mont toward Saint Côme du Mont, UTM 30U 06269 54678. It became a place of refuge for wounded on D-Day, both American military and local civilians. 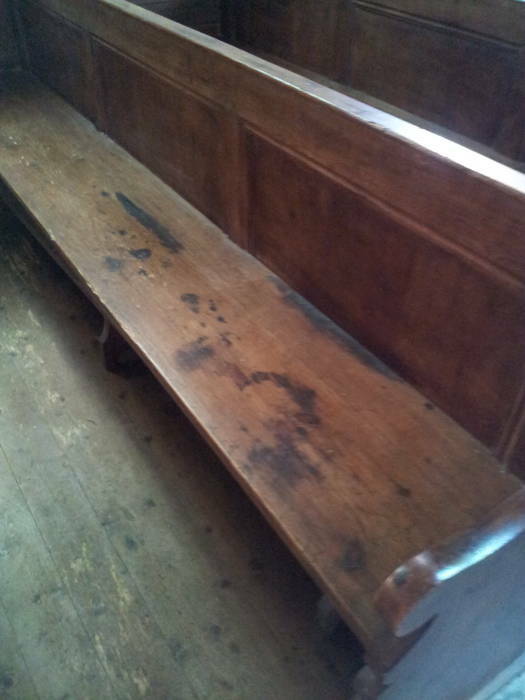 Stains on the pews are bloodstains from 1944. 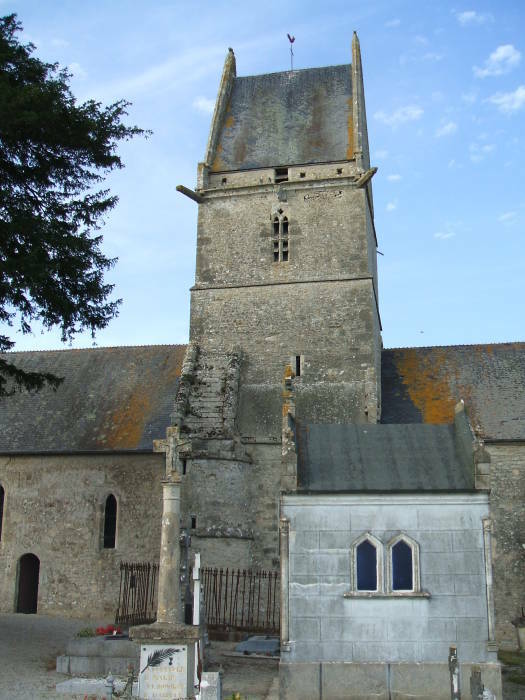 The church at Angoville au Plain. Il n'ya pas de plus grand amour que de donner sa vie pour ses amis. 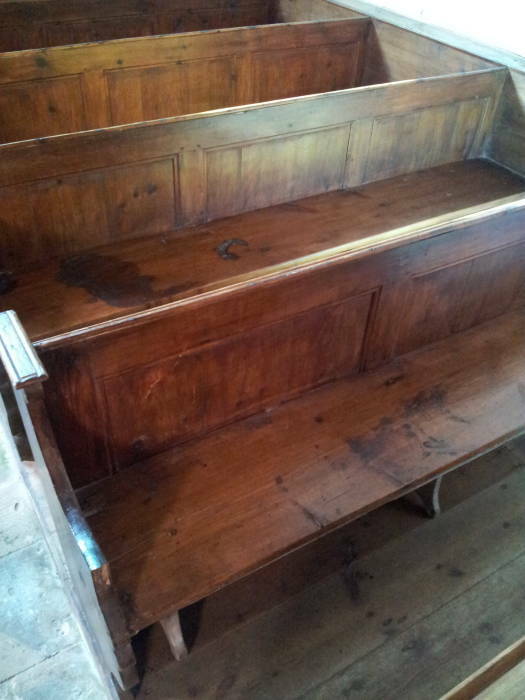 Bloodstained pews at Angoville au Plain. infirmiers 2e Bn 501 PIR 101st Airborne Division. et un enfant dans cette eglise en Juin 1944. Medics 2nd Bn 501 PIR 101st Airborne Division. and a child in this church in June 1944. Local people maintained two flower boxes at the memorial, and a wreath with fresh flowers was there. Like I said, I'm glad we didn't get asked about that nonsense about potato names. A former inn has been turned into a museum at a road intersection known as Dead Man's Corner. This is just south of Saint Côme du Mont, at the intersection of roads N 2013 and D 913, at UTM 30U 06258 54654. An infantry fight leading to armor involvement and a destroyed tank hull with a dead crewman's body led to the name. 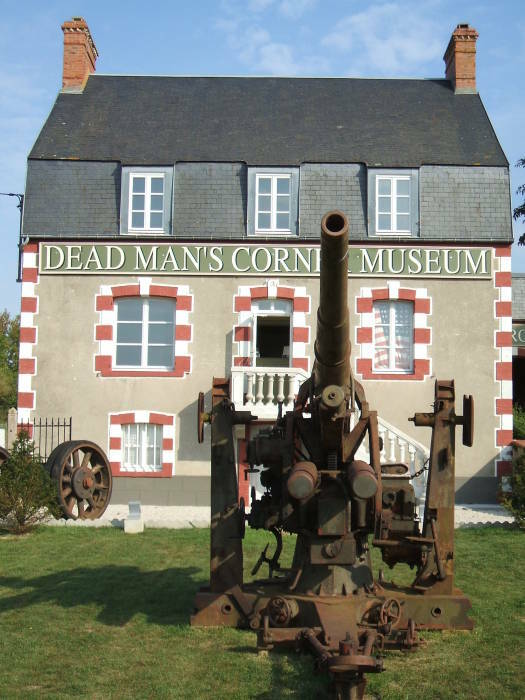 The former inn turned museum at Dead Man's Corner. 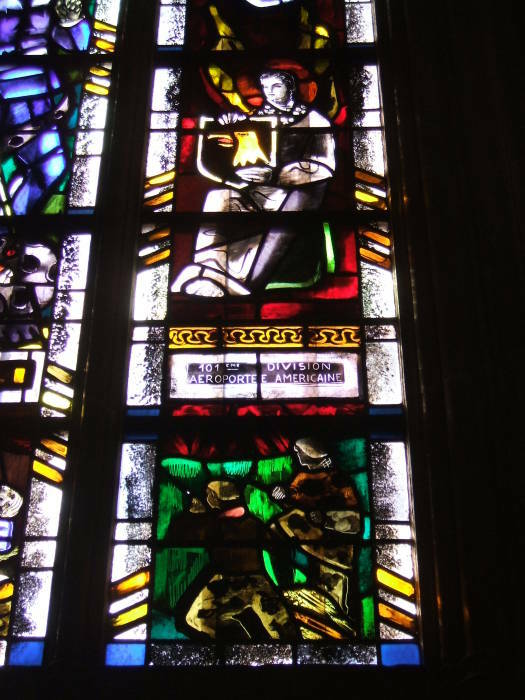 A stained glass window in Carentan commemorating the 101st Airborne Division. We visited Carentan, a much larger town well to the south of Sainte-Mère-Église on the way toward Saint-Lô. Carentan was a site of prolonged fighting in the days following the initial landings. Carentan was heavily damaged during the fighting. Well, actually it was largely destroyed. Much of it has been rebuilt since the war so there's not a lot to see of historic Carentan. 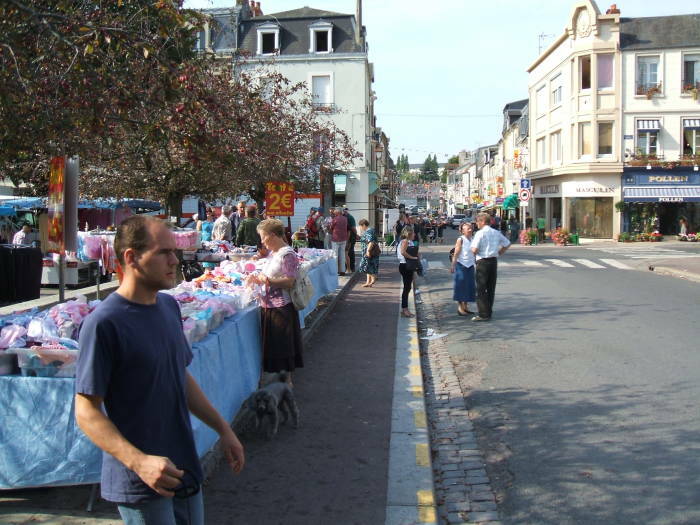 But because it's a bigger town it has a prosperous and interesting market, at least on Mondays. 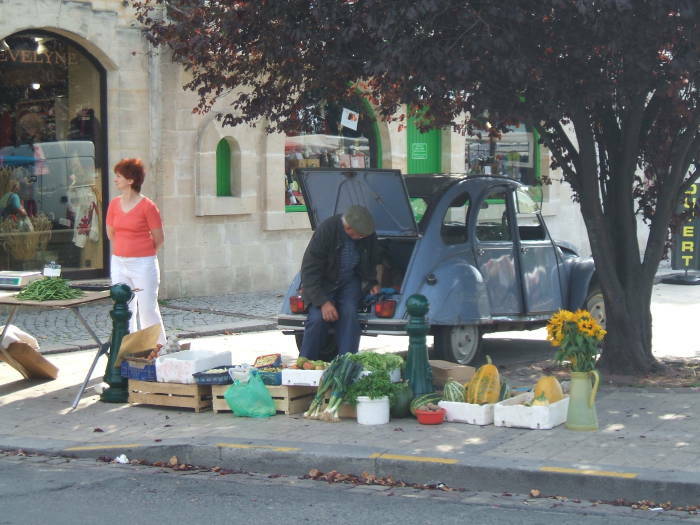 A local farmer sells his produce from the back of his slab-sided Citroën in Carentan. 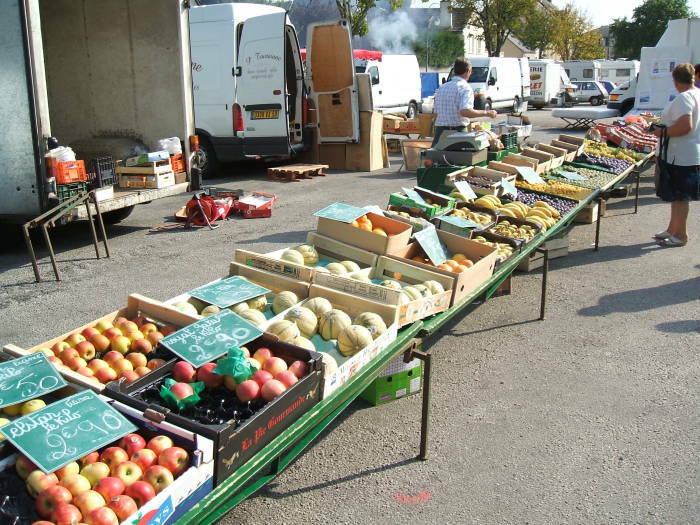 Fruit and vegetables on sale at the market in Carentan. 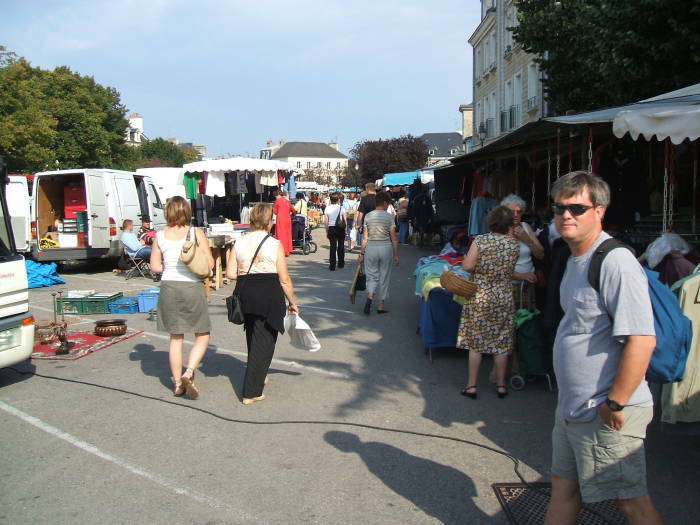 At the market in Carentan. Carentan is probably built on the site of Crociatonum, or Κροκιάτονομ, described by Ptolemy (90-168) in the Tabula Peurtingeriana, a description of the Roman Empire's road network and therefore the all-Empire road atlas of its day. If the Romans had insurance salesmen, they probably handed out copies of it along with cheap calendars. Anyway, Κροκιάτονομ or Crociatonum was the prominent city of a Gallic nation living in Brittany. This is a a good location for a trading center, so a prominent town has been here ever since. That led to it being a significant road and rail intersection, and so the fighting and its destruction in 1944.